Your commercial contracts are critical to your company, but if your legal team is spending all their time on them, they will never get to the strategic work. ... and many more, allowing your business to deliver better results and allowing your team to focus on value added, business advisory work. Radiant Law works for many of the largest companies, including three of the ten largest banks and seven of the FTSE 100 companies and across a variety of industries including financial services, media and technology. See what some of our clients have to say about us here. Radiant Law supports our clients’ day-to-day commercial contracts, from intake and triage through drafting, negotiating and the approvals process. We also help with contract management. the judgement calls of our experienced team of lawyers. For more about who we are see this page. Contracts need to be tailored, and the parties’ conflicting interests usually lead to negotiations that need to be closed. High volume, lower value contracts may be taking up too much of your legal team’s time. Companies enter into hundreds and thousands of commercial contracts a year. They need to meet a company’s objectives and manage risk. This requires proper legal support. In the face of the high cost of traditional law firms, the chances are that you have built out an in-house legal team to handle these contracts. We know that GCs are consistently asked to do “more for less” and demonstrate business value, while handling the increasing regulatory and other risks facing their business. However, legal teams are stretched to breaking point and the important is giving way to the urgent. There needs to be a way to make the contracting process simple and easy. Having worked across many different industries, we have seen and supported in-house teams to develop new best practices in the handling of commercial contracts. 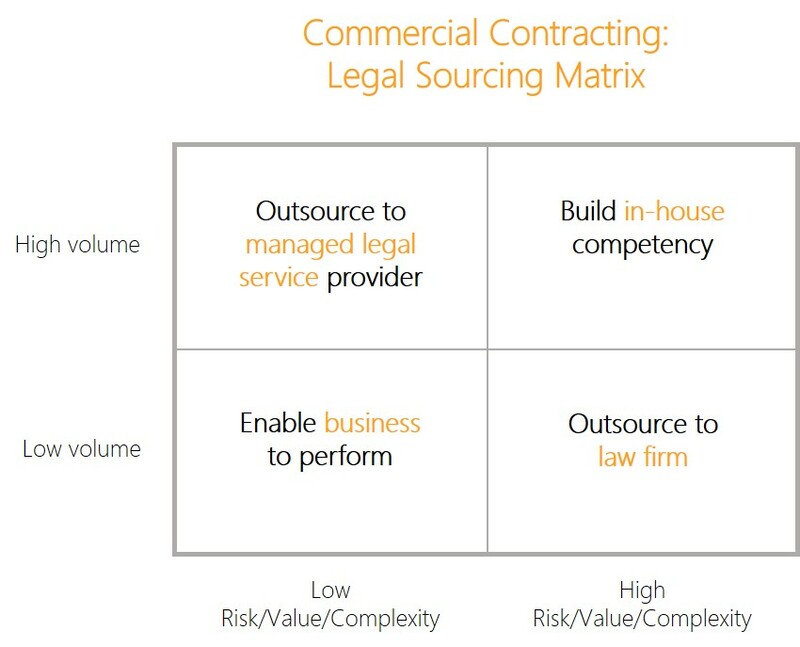 From this, we have developed a model, showing how the leading legal teams have progressed from the ad hoc support of contracts to optimising technologically-enhanced processes. A managed legal service provider supports the high volume, repeatable contracts, and brings technology and standardisation that can be used across your contracts. And that’s where our Commercial Contracting Service comes in. Through our Commercial Contracting Service, we support large companies’ high volume commercial contracts. We draft the contracts (or give the business teams technology and support to draft themselves), negotiate the mark-ups from the other side, support the execution of the contracts and can provide ongoing contract management. Working with you, we identify the contracts to be supported, clarify your needs and priorities and agree a tailored process that fits with how you work. Running a pilot allows you to experience the service and make sure that it really adds value. Throughout the pilot, we will be supporting agreements, helping get them off your team’s desks and fine-tuning the processes so that they work brilliantly within your environment. Regular governance calls allows us to make sure the service is meeting your needs. Timeframe: A pilot typically takes 1-2 months. and you are then able to decide whether the service is really adding value, and whether you want to proceed. The next step is to scale up the service and fill the support volume. We move to a full governance model so that we make sure that the service keeps meeting your needs and that any issues are quickly dealt with. We track performance against service levels and you will be able to see the live performance and the status of individual matters through our real-time dashboard. We believe that everything can be improved, so we have a formal quarterly programme to identify your priorities. Then, in parallel with delivering the service, we deliver three to four improvement projects during the quarter. At the end of it, we report back on what has been achieved and set the priorities for the next quarter. As part of this process, we create heatmaps of your contracts, identifying the points that are being over-negotiated and where templates and playbooks can be improved. The continuous improvement process means that you know that the business will keep getting a better service. Our mission is to improve the contracting process, helping your team keep delivering better results for your business. We believe that commercial contracts are critical to our clients’ businesses, but the way the contracting process currently works can be vastly improved. Solutions need to be tailored and there isn’t one size that fits all - so we build customised services that fit within your team and are focused on helping you solve your challenges and meet the needs of your business. We know that automation helps, so we use the best of what is available in the marketplace and where the right systems don’t exist, we build our own, like Remarkable and Flow. We introduce lawtech into your world without you having to run your own IT projects. We believe that improving contracting is a journey and that it must be guided by your needs. So we work with your team to make it easy to get going and then keep on improving based on your priorities through our continuous improvement process. The result is that we can accelerate you through the different stages of maturity of your contracting processes and help you become a market-leader in how you enter into and manage your contracts. The business is used to how we support them. Will it change? Our lawyers will act as an extension of your in-house team. They will think the same way, ask the same questions, understand your systems and processes at a granular level and have the same approach to the business. How will I know what I will pay? We provide services on a fixed-price basis and don’t charge hourly rates. The bundle of contracts to be supported and pricing will be set and agreed with you upfront. Will the service be consistent? We use playbooks to ensure that the contracts we negotiate reflect the positions you are comfortable with. These will be approved by you as part of the set-up and as they evolve. Where novel issues arise, we will escalate these to you for your guidance. Will I actually get this off my desk? We will update the playbooks to ensure that we don’t ask you the same question more than once. You decide when we will escalate issues to you, which will be described in the playbook. Will I own the playbook? Yes. The playbooks and any improved templates are your documents. If the services terminate, the latest versions will be provided to you. The playbook will ensure that we are not going beyond the positions you are comfortable agreeing, and include the rules for when to escalate. During the pilot we will agree service levels so that you (and the business) knows when to expect a response from us. You will also have management information via a live dashboard allowing you and your team to track performance against key metrics. There will also be regular governance meetings to update you on account progress and address any concerns. Will the solution keep getting better? Through our continuous improvement process, we will improve the account every quarter. We will update you at the end of the quarter on what has been achieved and agree the priorities for the next quarter based on your needs. Will I have the same people supporting me? A team of lawyers will be allocated to your account, led by an experienced Radiant lawyer (your ‘account lead’). Our lawyers support multiple accounts so that we can handle spikes in volumes. How will spikes and volume fluctuations be handled? Our services are scalable to ensure a consistent level of service through periods of high demand or staff holiday leave. While a standard team will be allocated to your accounts, other Radiant lawyers (think of them as the ‘bench’) will be ready to step in and support as and when needed. What happens if there is a change in the team supporting me? We will always inform you of any team changes and will introduce any new joiners to you and the business. We have a detailed onboarding and training process to ensure that team members fully understand the account before starting to support you. Our Commercial Contracting Service gets high volume contracts off the desks of your team and lets them focus on the strategic work, delivering business value in all the other areas that need attention. At the same time, we will help you deliver more business value with the supported contracts themselves, by speeding up the contracting process, handling volume spikes and delivering revenue and your projects faster. And you will be able to show the improvements, with better data and live dashboards. We also help you meet the “more for less” challenge by delivering a highly efficient and cost-effective service that can scale to keep up with business demands, allowing you to get more done within your budget. As one client told us: “what you do is the one thing I don’t have to worry about”. "Their system means our in-house team can focus on the stuff it really needs to focus on."